The Brother MFC 660CN is an inkjet colour printer that is capable of printing directly from memory card and is equipped with an answering machine. This device is a multifunctional all-in-one device as it can print, copy, scan and fax and can handle small office or personal tasks very efficiently. Brother MFC 660CN is quite a lightweight and highly portable device as it weighs 8.5 kgs only and measures 7.1 x 18.4 x 14.6 inches (HWD). The printing speed is 27 ppm in monochrome whereas it is 22 ppm in colour. The copying speed is 20 ppm in monochrome and 18 ppm in colour. This printer is equipped with an Automatic Document Feeder having a capacity of 10 sheets. The input tray has a capacity of 100 sheets whereas the output tray has a capacity of 50 sheets. The Brother MFC 660CN Ink Cartridges are positioned in the front of the machine thus enabling their easy replacement. There are slots for inserting CompactFlash, Secure Digital, MultiMediaCard, Memory Stick, Memory Stick Pro, SD Memory Card and xD-Picture Card along with a USB port right above the paper access opening. Along with the colour and multifunctional capabilities, the Brother MFC 660CN is an inkjet printer that is highly efficient. It can be rightly quoted for this printer that the advantages side line the drawbacks of the printer. Equipped with excellent connectivity options and good printing speed, this printer outshines among its range of printers, thus making it a great choice for personal and small office use. Q. What all devices can I directly print from with Brother MFC 660CN printers? A. You can use a computer, a CompactFlash, an SD card, a MultiMediaCard, a Memory Stick, an xD-Picture Card and a PictBridge enabled camera with your Brother MFC 660CN printer. Q. How many pages can Brother MFC 660CN ink cartridges print without having to be replaced? A. Original Brother MFC 660CN black ink cartridges can print up to 350 pages without having to be replaced and colour ink cartridges can print up to 300 pages each. Whereas, compatible Brother MFC 660CN black ink cartridges can print up to 500 pages without having to be replaced and colour ink cartridges can print up to 400 pages each. Q. What are the dimensions and weight of the Brother MFC 660CN? A. Brother MFC 660CN printers weigh around 8.5 kg and measure about 7.1 inches in height, 18.4 inches in width and 14.6 inches in depth. Q. Where can Brother MFC 660CN printers ideally be used? A. Brother MFC 660CN printers are fast, enable the user to print from multiple devices and produce good quality outputs. 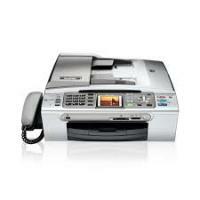 They can also scan, fax and copy making them perfect for small offices. Q. Can I expect the same quality output using compatible Brother MFC 660CN ink cartridges as original ones? A. Yes, absolutely! We assure you that you will not have to compromise on quality using our compatible Brother MFC 660CN ink cartridges. They are FSC tested and certified and will produce the same quality output as the original Brother MFC 660CN ink cartridges. A. Simply insert the CD-ROM that you got with your Brother MFC 660CN printer and follow the instructions prompted on the screen while choosing the appropriate settings for you. For more details, you can refer to the setup guide here. Q. What should I do if a faulty item is delivered to me?